So, after my last post, I ended up sick as a dog. The bad air in the ‘No, the cigarette in the car, etc., got to me, and I spent most of that week lazing around, trying to cough up a lung. I’m still coughing quite a bit, and the postnasal drip is back. While I laid around, I did manage to get my Kindle all set up and read a couple of short pieces (the fiction for Numenera and The Strange), as well as digging into FATE Core again. Once I went back to work last week, I was able to read some in the car between cities, which is good. I haven’t done much with the StarSea; in fact, I don’t believe I thought much about it at all. Part of being sick, I guess. 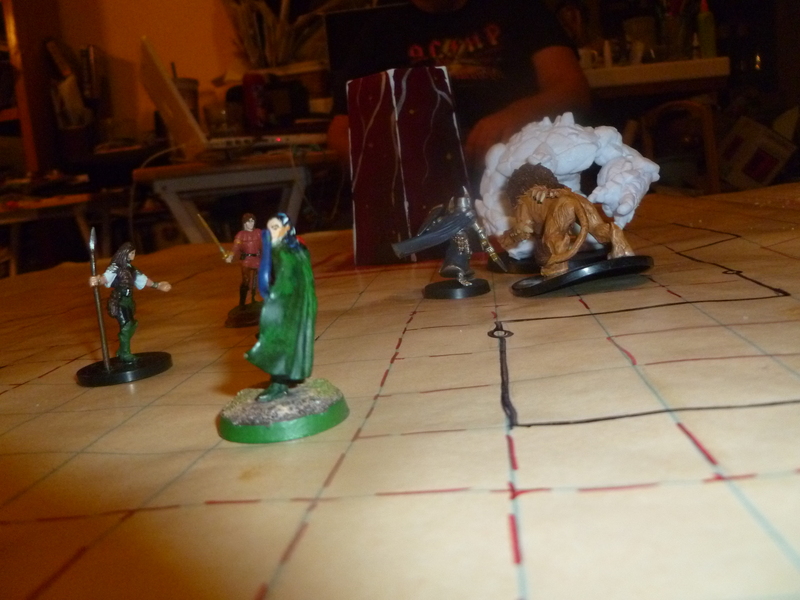 On the other hand, I ran my penultimate game of my 4e campaign last weekend. I think I had the PCs fairly challenged. 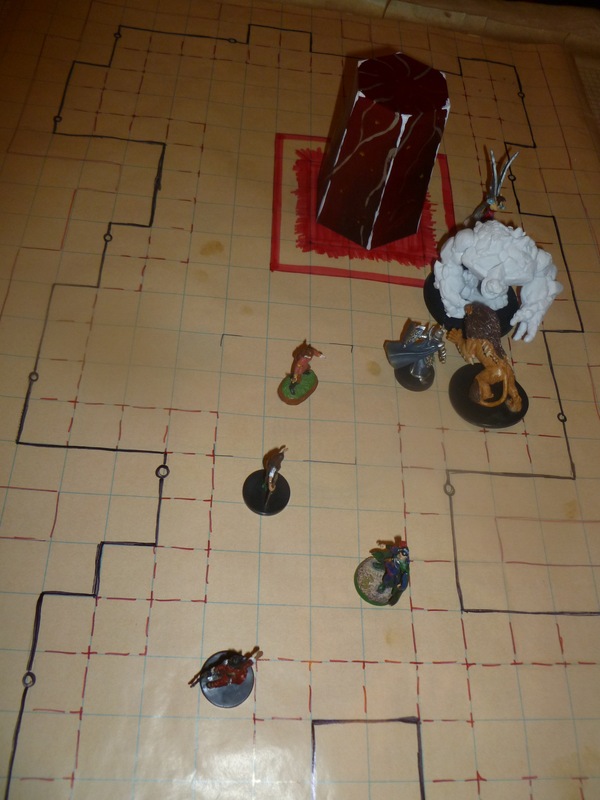 They faced Asmodeus, and the 30th level PCs messed him up pretty quickly. Yes, I’m happy with that. 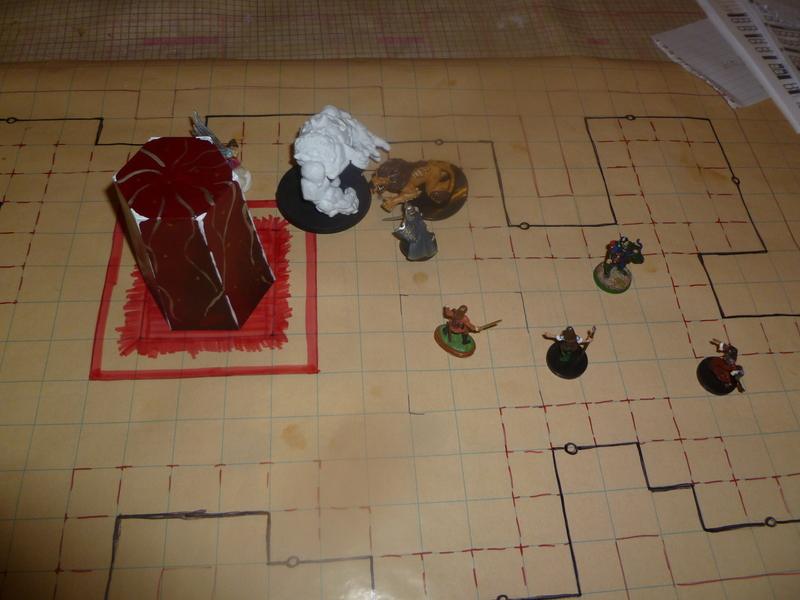 The combat ran pretty quickly, and the PCs took a few hits. And I was quite inspired for the next session, which is the end of the campaign. There are some elements I’m thinking should be part of the story, but I’m not sure if the beats I’m thinking of truly add to the story or not. I suppose my uncertainty means they probably shouldn’t be added, but I can’t say more than I have, as some of my players actually read this blog. That’s pretty much all I have to report, as illness, work and holidays have sucked up my time. Once my campaign is done, I’m hoping to focus on the StarSea more, but that will include a lot of reading of different game systems. Maybe I’ll start doing reviews of those systems as I go, comparing them to what I want in a game. So, the car is still an issue. It seems the computer is regularly disconnecting from the rest of the car or something. I drove quite a bit Friday before the engine light came on, and after resetting it again Saturday morning, it lasted nearly 40 miles (to the Smalls from my place, back and forth downtown from their place, and home again) before the engine light came on again. The car runs fine otherwise, so I assume there is something loose or just glitching. It’s due for it’s 50K mile service soon, so I guess combine the two, spend the last 2K$ of my inheritance, I’ll get both taken care of and out of my hair. I also inherited the Girl’s now superseded Kindle yesterday. It’s the e-reader only version. One of the cool things about this is I can now take some books along with me (especially the Kindle versions of FATE Core and supplements) and read them while riding and not get asked a lot of questions. (Yes, I’m one of the lucky ones that can read while riding in a car, so long as I’m not in the mountains. I get motion sick if I read in the mountains, but not on flat roads.) My biggest issue is that so many of the books I’ve acquired have been freebies from other websites that I’m having to add them to the Kindle by wire and sort them later. I’m going to try to get the Kobold Guide to World Building for Kindle after Christmas, one way or another. I’m still planning on picking up an iPad mini someday, but this will do for now. My cough has come back. Not sure which contributing factor is the ultimate cause. A car I rode in Friday was found to have a partially smoked cigarette in it, and I was in the car for about a half an hour. I’m allergic to cigarette smoke, but I have no real sense of smell, so I couldn’t detect it any other way than getting congested. It could be not getting as much sleep as I probably should (a couple of late nights before early mornings). Or it could be the soup we call air here in the ‘No is getting to me. We’re in that lovely “Unhealthy” band as we’ve had no appreciable rain this fall, and may not get any for a while. The weather guys are saying maybe next Thursday, but who really knows. So, I’m back to drinking the knock-off DayQuil (which seems to work better for me that the brand name stuff) regularly. Ugh. That’s about all I have to report right now. Later. That describes this week: hectic. I’ve been working, and I’ve got some writing to share, but home life has been … hectic. and a lot of it is my own creation. You know that guy in the daily comic, B.C., the one with the glasses? His name is Klutzy Karp. That could easily be my name. Tonight, about 9PM, I knocked over a shelf with some of my forgotten mini painting projects while digging something else out of my closet, which needs to be cleaned anyway. I spent the last couple of hours cleaning that mess up and re-organizing those projects. Monday this week, before we went to sign the last of my Dad’s probate papers, including the one that will enable me to put the car into my name first of the year and reduce my insurance fees, I finally got my car in for an oil change, about two weeks late, delayed in part by tiny paychecks. Tuesday, coming home from work, my “check engine” light came on. Yesterday morning, my remote starter wouldn’t, but the car would start with me in it. I sweat bullets for a few minutes, thinking my car might be dead. Couldn’t do anything about that until this morning, and the oil changers said, “Wasn’t us!” and then proved it. Their diagnostic device wouldn’t communicate to the computer in my car. They suggested a hard reboot of my computer (i.e. disconnect the battery for a few seconds) and see if the reset would clear things. It cleared the “check engine” light, but it still won’t start by remote. I’m hoping that picks up after the car’s been driven a while, because it’s damned convenient, especially in more extreme weather (or what passes for such here in the ‘No). So, I’ve done some thinking and writing about what general powers the different factions in the StarSea should have, and what they allow the knights of those orders to do. Still on the fence about how to treat those who want to play without magic on their character. Are the Martials an order? what special abilities do they have, etc.? Got to digging into FATE Core again, after being distracted by Numenera. Having to review what I read so I can remember what the terms mean and how the rules function and act as foundation for other rules. I’ll have to do the same with Savage Worlds when I get back to that. Finally came to the conclusion that I’ll never figure out what kind of game I want to build for until I figure out what I want the game to do. Need to get the cart and the horse in the right orders. Got to looking tonight again (before the big spill) at the version of Chainmail that came out around the time of 3.0, and became the D&D Miniature Skirmish Game (at least, that’s what I think it was called). In fact, I developed some of the stuff I have in this setting for that game. It’s an extremely simplified version of D&D 3.0, and I liked that simplicity. I had created some conversions of the characters in the campaign I was running at the time. Only real problem I have with it is the pseudo-Vancian Magic system it uses, which is a slimmed down version of the Vancian Magic D&D has been using for a while. I’ve mentioned before I don’t like Vancian Magic. This is less egregious, but it’s not what I want. I want an even more simplistic magic system. That’s about all I have time to report. Working and socializing tomorrow. So, last night the Heart of Evil model got used. I also found an Earth Elemental that was perfect for Timesus, the Black Star (an undead earth primordial). 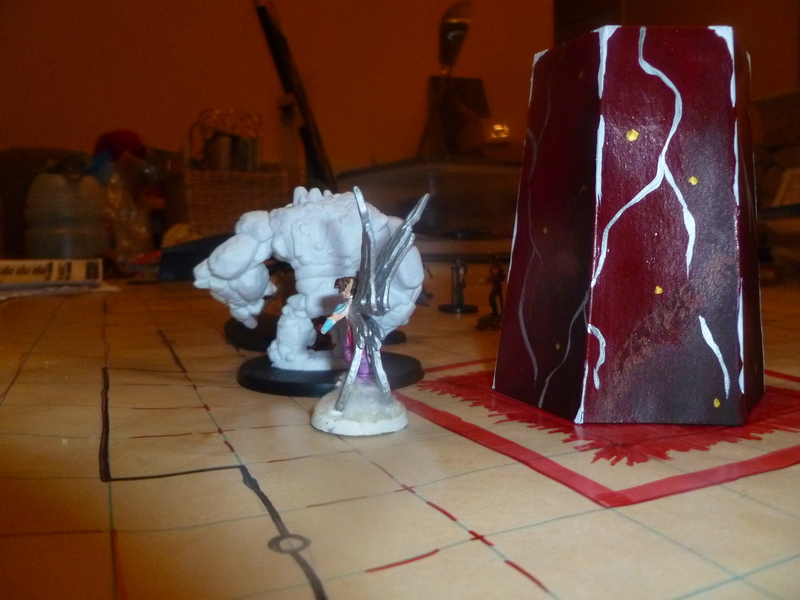 Here’s some pics from late in the game, just before the primordial was destroyed a second time. Thanks to Robin Small for the pictures. 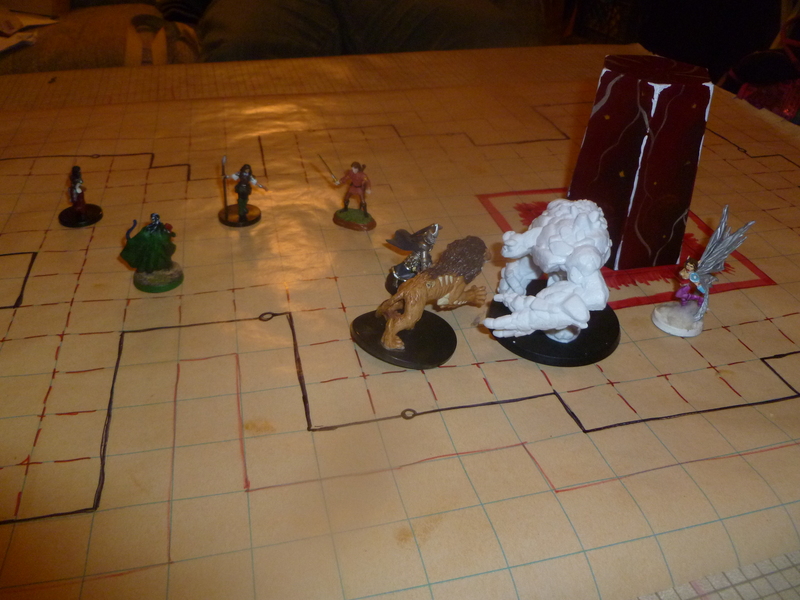 The large lion figure is our druid, predator build. And that archer should be facing Timesus, as he delivered the killing blow, as usual. Not sure why the spear-weilding figure is on the board, as that’s the druid’s human form. The winged figure is the Girl’s eladrin fighter, but she was in a major Tinkerbelle phase, and wanted wings on her figure (and the 4e pixie rules hadn’t been published at the time we created the character). The map is on Gaming Paper. We had issues, and it breeds from two things: Young, easily bored children; and a slow, boggy combat system. This weekend really set me in bad mood towards 4e. Combat hasn’t been fast since the start of 3.0, but I know 4e has been slower from the start. Higher levels doesn’t make it any better. More options, more dice rolled, more hit points; none of these things make for faster play (although the environment of the Extraction Level encounter from E3: Prince of the Undead, which is the map above, nearly did in one of my PCs). It’s not that the combat went lots of rounds; we only played most of five rounds. It’s not that the combat ran late, as some have; we finished the battle by 10:45PM. It’s just that each round took about 30 minutes. I mentioned to my players that I had watched The Strange RPG Inaugural Game video, and in an hour and a half, they managed two combats and a decent amount of roleplay. The kids prefer combat, as it seems more exciting to them (and they get to be badasses, not relatively powerless children), so the game has moved more towards combat. And I don’t mind running a combat every session. But having to scream at kids to pay attention rather than play video games between rounds is proving to be a hassle, and resulted in poor behavior on the adults’ parts as well. It’s all reaffirmed my belief that I won’t run 4e for my next game. Some part of me is tempted to look into the 5e playtest material, and see how combat works, but the way things have been handled have left a bad taste in my mouth for it. On the other hand, I got a pretty sizable paycheck for working nearly a full week before Thanksgiving, so I splurged a little and picked up the FATE System Toolkit book. I looked especially at the magic systems and came to the conclusion that building the StarSea with that system would be pretty easy, as it’s intended to be an easily extensible game. I still have my concerns about the kids being able to create Aspects that will actually work for it. I would expect character creation will be quite time consuming, should I use FATE, with much of that time being spent in negotiations. I also got out my copy of Grant Morrison’s 18 Days, with art by Mukesh Singh. It’s an art book that is filled with storyboarding for an animated series Morrison wants to do of the Indian myth-cycle called the Mahabharata. One of the elements of the artwork is that the gods carry technological versions of ancient weapons, as well as techno-chariots and so on. If you get a chance to look at it (I don’t think it had a really large print run), I do recommend it. But I wanted to give the art a look again, just to see if any new ideas spark, or maybe something to refine an existing idea might jump out at me. Anyway, it’s getting late, and I need to hit the ground running tomorrow. Not for work, but I need an oil change in the car, to take my mother out for some shopping, and some other tasks before we go off to finalize my father’s estate and bring probate to a close. Building the Heart of Darkness, Final! Wow! I was really expecting that paint job to take a while, but I was quite happy to have it completed quickly. My idea was sourced in two descriptions, one being the description in the module I’m pilfering from, one is that of the Abyssal Plague, which WotC completely dropped the ball on. It was their feeble attempt to link the 4e universes, and they put out a handful of books and articles, and had a couple of encounters in one of the D&D Encounters adventures, and they let it go. However, it fit very well into my campaign concept, so I ran with it. The Heart of the Abyss, I’ve decided, is the source of the Voidharrow, and is also Tharzidun’s prison (yeah, I know it’s supposed to be Tharizdun, but I find “Tharzidun” rolls off the tongue a little better). The Abyssal Plague was described as creating red crystals with gold flecks and silver streaks. The Heart of the Abyss is described as a red crystal that might be the shard of a dead universe, one destroyed by the obyriths. I combined the two descriptions for my model. 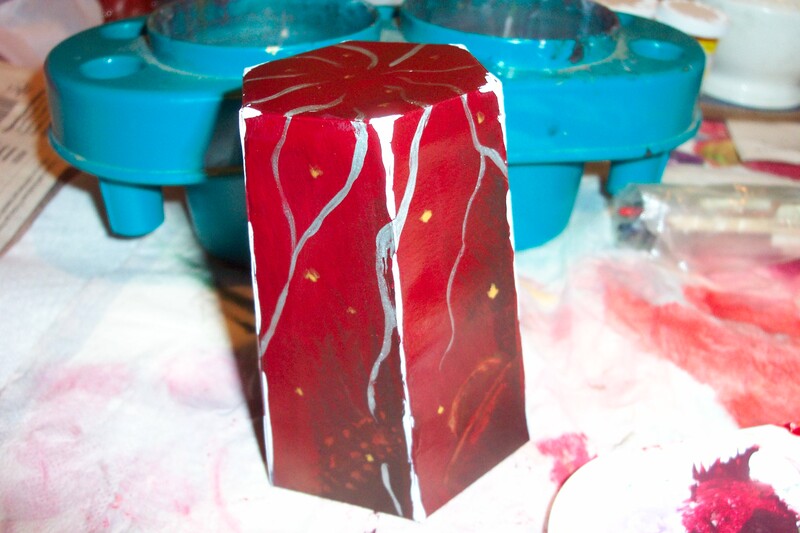 I did some quick and simple shading with some darker shades of red, then painted on some dead worlds in the depths of the crystal in shades of brown. Next, I gave it a wash of red ink, to mute the colors of the dead worlds and tie every thing together. 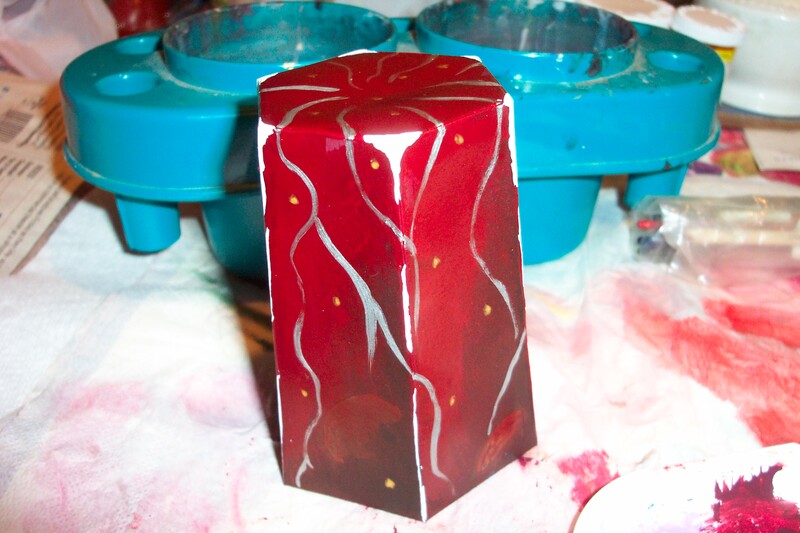 My fourth step was to paint on the gold flecks and silver streaks. I did the silver to look a little like marbling. Finally, I added some white highlights along the edges and corners of the model to represent the sharp highlights of gems. Here’s some images of the final result. 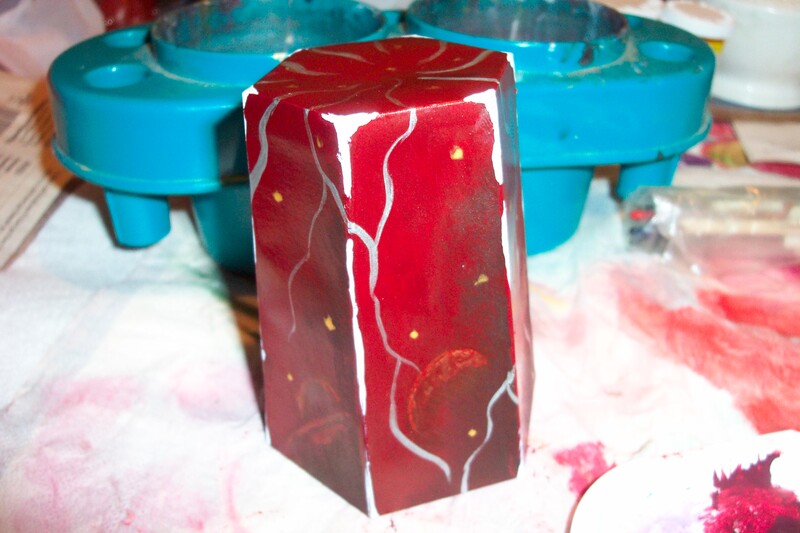 I was going to matte coat it, but the ink adds a nice glossiness that I don’t want to loose with the seal. Until I use it, it’s in a plastic box that should protect it nicely. That’s all for tonight. Later. So, even though it was pretty wet out today, I managed to get the base coat of paint on the model. As expected, a lot of it soaked into the paper. However, I’ve been using a new paint, the P3 base spray paints by Privateer Press. They have a very different consistency than the Games Workshop paints I’ve been using. GW paints are a bit thick, and when I used them on papers in the past, they’ve left a layer on top, and strengthened the paper. The P3 paint is almost like an ink. In fact, I accidentally sprayed it on my hand today (didn’t remember how the different spray nozzle worked), and it ran like water across my hand. So, the model isn’t really any heavier walled than it was. I’m a little disappointed with that. So, now that Marvel’s Agents of S.H.I.E.L.D. is over, and before Person of Interest gets rolling, I’ll be trying to get the red tones going I want on the model. Time to get out the tank brush and start rolling. I’ve got to get as much going as I can as I finally have some work this week, as of tomorrow. 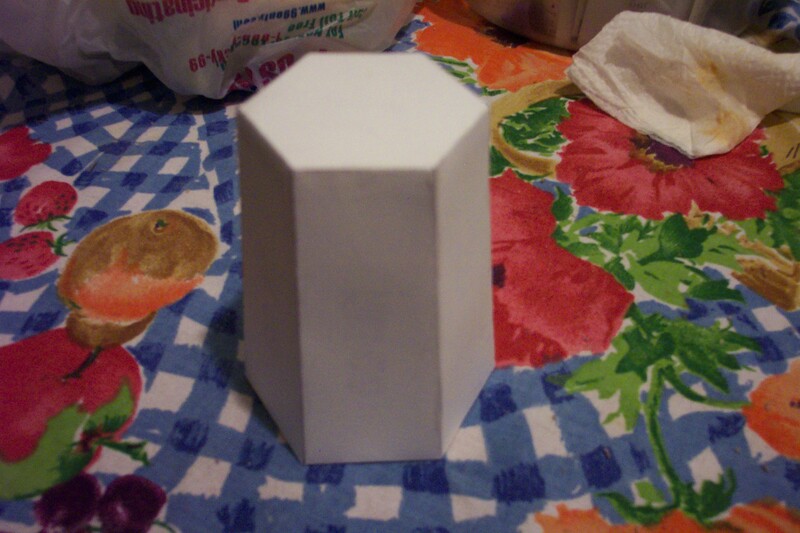 I got to sit down and build the basic shape of the crystal, the Heart of the Abyss. I’ve stated to my players that it’s about 15 miles long, so this is just a tiny portion of it. Here’s my progress until this point. That image makes it look like it’s more cylindrical than it is. It actually tapers slightly to the top, about a half an inch on each side, I think. Tomorrow, provided I’m not working or get in before it gets too dark, I’ll be spray painting it black, preferably multiple times, to get both good coverage and to strengthen the cardstock. If you’re interested in my pattern, I’m including it below. Some construction notes on my model: I would recommend doing each wall panel to another (but not closing them), then attaching them to the top, and then attaching the bottom. I scored all the folds first, and I folded in the bottom tabs in, clipped them both, then inserted the base and glued it. You might want to glue some of the top and base on first (like four of the six) so you can get a solid connection, then glue down the final tabs. I did mine by gluing a couple of wall panels to the top, then to each other, then to the bottom. I actually had to reprint the page because two of my wall panels somehow got stuck together (likely something on the table) and essentially destroyed. While I waited for the printing, I glued the four wall panels and top and bottom I had together, then completed the model. Note, it’s not really an original model. It’s based heavily on this item: Leo Hartas’ Guard Tower. Basically, I used his template to create a similar tower, and then for this model reduced it 70%. Go buy his for a challenge. It’s very cool (I bought it myself years ago, along with the tank). That’s all for today. Later. I never commented on my cold in the last few posts. Well, outside of the issues last night, post-Pad Thai. My cold is mostly gone at this point. I’m still coughing a little, and getting up some phlegm, but not the deep, throaty coughs that go on for long stretches that I’d been having. Even my hands are doing better. I’d been dealing with some kind of flakiness on my hands, especially my right hand, so about two and a half years now. In limited places on my hands (mostly the fingers, and not the whole finger), the skin would get dry, stiff and hard, and then split in different directions, depending upon the knuckle. Up until a few days ago, I’d been using Gold Bond Ultimate Healing lotion before becoming really active for the day and at night before bed. I haven’t treated them in a few days, and most of my hands are in good shape. The inside middle knuckle of my index finger on my right hand (yes, this condition is that specific) is starting to get flaky, but the other places the condition has been bothering me have mostly cleared up or been under control. Today, I started work on a prop for my next session of my 4e game. I’m using three encounters out of E3: Prince of Undeath as encounters in my own game, pretty much as written. 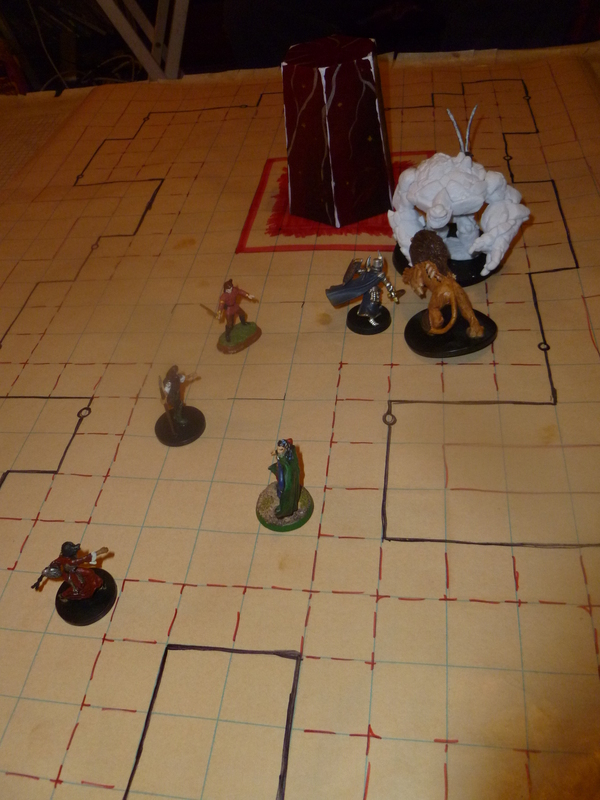 In the module, the PCs go to the Heart of the Abyss (AKA the Seed of Evil) to find out what Orcus is up to. There is a platform built around the huge crystal’s upper point. I’m building a cardstock crystal for our battle map. 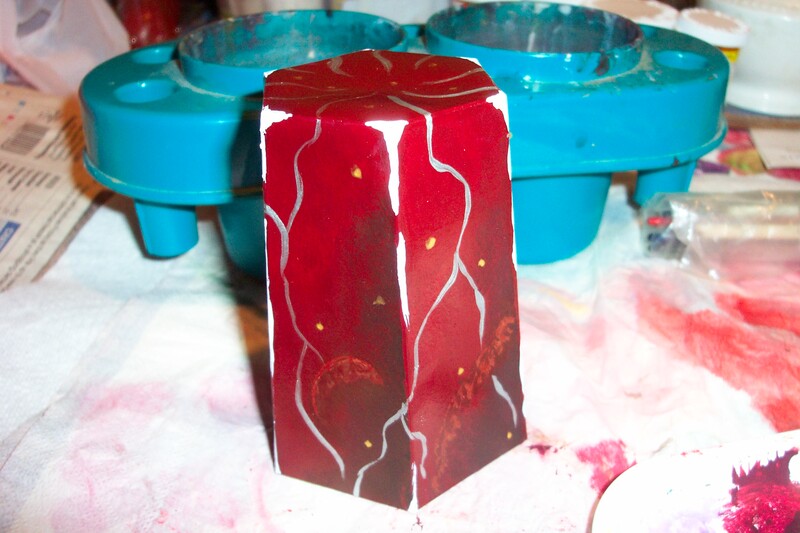 I’d co-opted another papercraft design for a tower on a hill to make a different tower as scenery. I dug up the digital files and edited them for size. I’ve got the pieces printed and cut out. I need to glue them together and them spray primer and then paint some quick details before next Saturday. I don’t work tomorrow, and other than some chauffeuring my mother around, I should be able to spend a good sized chunk of the day working on it. Not that it needs it. I should be able to glue it together in about half an hour, if nothing goes catastrophically wrong. Some time to dry and a spritz shouldn’t take too long. Anyway, that’s pretty much all I have to report for today. Later. So, this morning and early afternoon, my sister and I put up most of our outdoor Christmas lights. I expect she’s done more since I left for the afternoon, and I’ll be interested in seeing what they look like. I’ll probably post images on Facebook for all to see. I then went to Target in desperate need for underwear. Seems the underwear companies have pulled a fast one on us big guys since the last time I bought underwear. I used to be XL. My waist hasn’t gotten any bigger, but now I wear 2XL. I call shenanigans. Freakin’ underwear was expensive. I’m going to try boxer-briefs this round, as the last underwear I was given was fine around the waist, but too tight around the legs. May have been part of that resizing crapola. Dinner was Pad Thai. I think I overdid it with both volume and spices. It was a little on the hot side, and I’ve had grumbly stomach and a headache since. Soon, I’ll go to sleep it all off. Otherwise, I haven’t given a whole lot of thought to the StarSea today. I have started a list of what the Psionic Order can do in my head, and I need to start writing these things down, but I just haven’t taken time today. Part of me is thinking again about creating an OGL system for the StarSea, going to similar extremes as True20, combining in some 4e ideas (like healing surges, power sources and roles) with simplified classes and powers, limited feat selection, and some other odds and ends. There was a d20 game I picked up called Spellslinger, which was a magic-infused western game. They only had three classes, a gunslinger, a scout and a gambler, and then through the use of feats, characters could add on magical powers. I’m thinking something like that might better accomplish my goals, and I can work around some of my other issues. True20 also eliminated iterative attacks and hit points, and really showed the flexibility of the d20 system. I’ve enjoyed the NaBloPoMo this year, and including personal stuff made it a little easier. I think I’m going to try to post more irregularly (that is, I’m going to stop trying to save up for a once-a-week posting schedule), with more of the personal stuff as well as the gaming. I’ll maintain my promise to keep the politics out. Not reading a lot of Facebook is helping in that regard.